So Beauty Creations has actually come out with glitters and I’m totally loving them! (It should be noted that these were sent to me, however my opinions are completely unbiased and 100% my own). 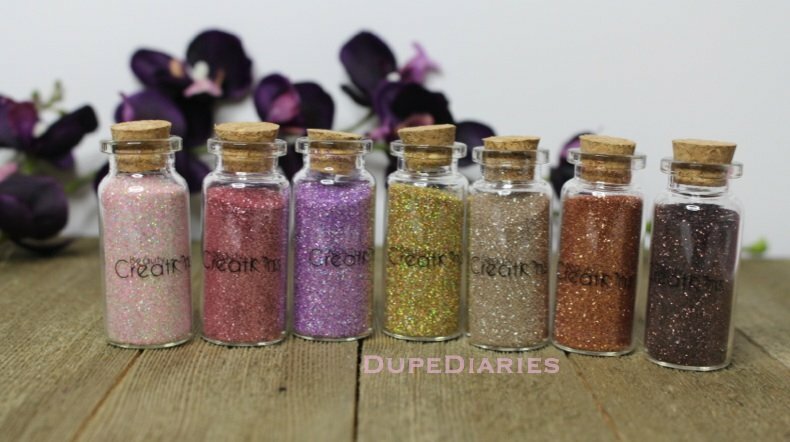 I think that for the first initial batch of glitters Beauty Creations released was really pretty and they’re all easy go to type of colorful glitters. If your usual go to look is something more natural or bronzy, these would be a good way to get out of your comfort zone (Minus the aqua blue, black, and purple glitters… maybe the sliver too). Overall the colors are really cute and easy to wear (Especially “Dreamgirl,” a more copper color, and “Rosebud“, a light pink glitter). Now aside from the colors, like every beauty you tuber says “Can we talk about the packaging?” Honestly though… it’s really cute and super cool. 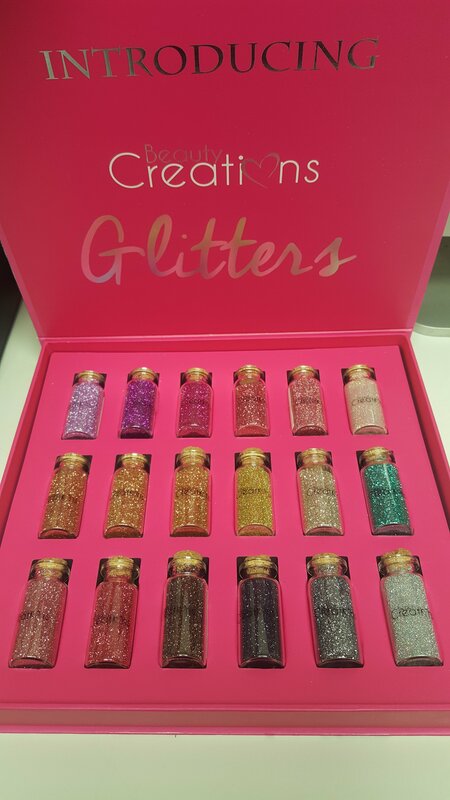 I know it’s pretty basic, it’s a small glass container, but I REAAALLLYY love it… I think I may have been more excited about the packaging than the glitter itself. I mean… I love how glitter looks and I love anything glittery… I just don’t like the removal processes. Let’s be real, glitter gets EVERYWHERE and is pretty hard to get rid of (I’m talking about those random specks of glitter you find three days later). But seriously though, the packaging really works well for glitter. It fits a lot of glitter in it so the price is really good especially in comparison to other brands that carry glitter for $7+ with 1/4th of the glitter (if that) these carry. 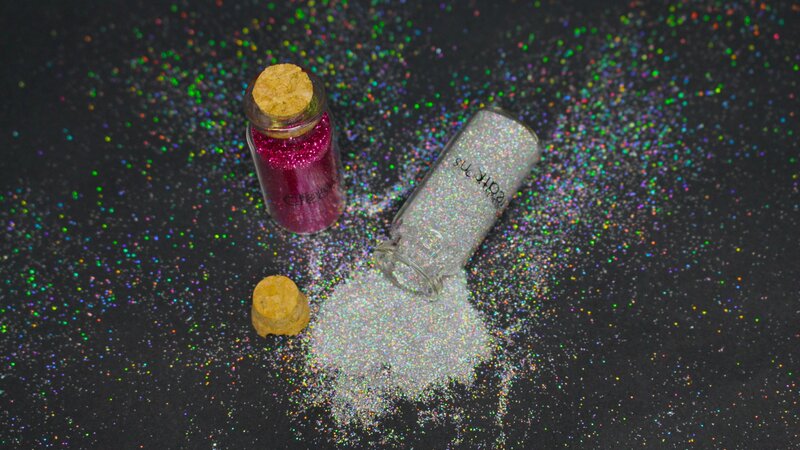 On top of that, it’s easier to pour glitter in and out of the bottle (Which can be a bad thing if you forget to put the stopper on… or spill it over on accident). But just as easily, the bottle makes it easier to dip your brush inside just as easily. The only downfall I can see with this packaging is the fact that it is glass, it might break if you accidentally drop it; but I think the bottle being glass makes it more classy versus a plastic bottle (Plus these glass bottles are reusable for something else, or decoration). 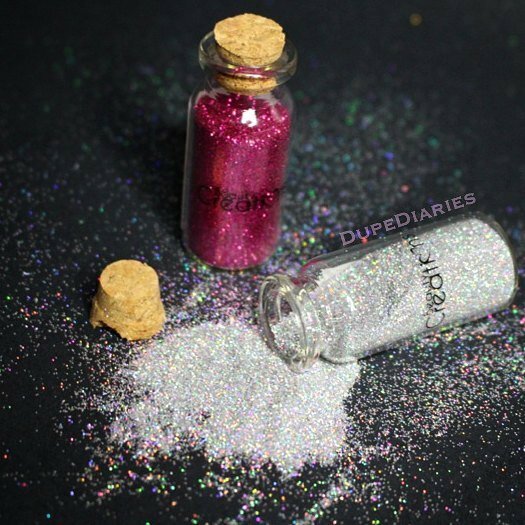 These glitters last just as long as any other cruelty free glitter all ready out there, and they’re at a much more affordable price point. I tried these out with different glitter glues, and it’s really the same thing… just costs less. Beauty Creations will be coming out with their own glitter glue so I’m super excited about that (Be on the look out for that review).